These tiny bits are helpful aids for installing any of the various Cir-Kit Concepts' wiring and lighting fixtures. Their use greatly enhances and simplifies installation in all types of wood. The No. 55 bit is used in for the small hollow eyelets used at tape run interconnect points. Measures .052" in diameter. The No. 66 wire-size bit is used principally in the CK104 kit for making the proper size hold for "fixture" and "circuit" type wires. Measures .033" in diameter. The No. 70 bit may be used in place of a push pin for making .028" holes in copper tape runs This size hole allows easy bradding of either a 12-volt GOW or wire terminal bulb into a conductive tape run. The No. 75 bit allows drilling of small .021" holes at tape juncture points for easy insertion of 1/8" brads in hardwood or Masonite structures. (May also be used for outlet and switch nails.) 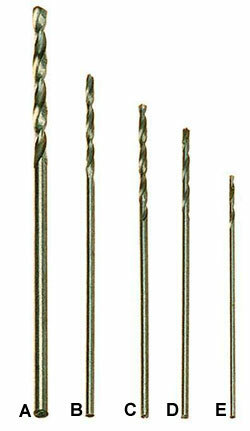 The drilling of holes simplifies brad installation and assures a tight electrical fit between the brad and copper strip. All bits may be used with either a 1/4" electric drill or the CK201 Mini Drill.